You want a six-pack but have no idea where to start or what exercises you should focus on… We have all been here at some point in our fitness journey and that is why I am glad you stumbled upon this page when you did: to take out the confusion and give you a clear cut plan to finally get your six pack abs revealed. There are plenty of great exercises out there that you can do to get a six pack. In fact, you should be doing a wide variety of workouts and exercises to attain the kind of abs you are looking for. Is it possible, though, to do just one single exercise to get your abs to start showing? What I first must point out, is getting six pack abs takes an immense amount of work and the exercise I will be revealing to you below is one that everyone is not too fond of. See, people always want the easy solution or the solution that requires no work. You will not find that here. Getting your abs to show takes hard work and dedication, but in the end it is all worth it! If you are willing to put in a little bit of work (ok, a lot of work) then read on and discover the best six pack abs exercise on the planet! As we have discussed in the past, if you want six pack abs, you must bump up the intensity in your workouts. Successful people do the things that unsuccessful people are unwilling to do. 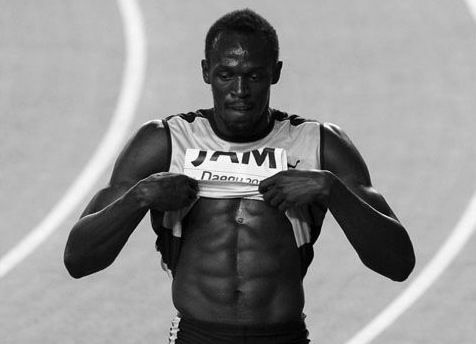 That is what makes Usain Bolt great and that is what you must do to get six pack abs. Everyone wants the easy solution, but when it comes to getting abs, there is no easy solution. It takes work. The answer lies in the video: sprints! The best fat burning and ab building workout on the planet is sprints, period. Researchers tested 11 men and 11 women, all of whom were working out at different levels of intensity. What researchers found was that the group of individuals working out closest to their anaerobic threshold, they experienced maximal fat utilization, with most of the fat coming from their belly. They are very difficult and an exercise hardly anyone wants to do! If you want results, you have to think different. Be willing to do the things that those spending hours on the treadmill and elliptical are unwilling to do. That is what it takes to see the rapid results you are looking for. Step One: Head out to a track or field. Step Two: Perform a 30-60 yard sprint, walk or rest for 30-60 seconds and repeat 8-12 times. A workout just like the one above will burn you double or triple the amount of fat that a long slow cardio workout ever could. That is the power of sprints. If you want the best six pack exercise, I am telling you right now to start sprinting. Don’t delay, get it done. Be different!